It looked easy when I watched people do it on TV and YouTube, but I was still intimidated. Seeing people demonstrate in short segments on DIY shows or online videos actually highlighted in my mind everything I didn’t know about how to do the project. Instead of just jumping in and trying it, I let the unknowns and my insecurities keep me from doing something I had been thinking about for a while. I’m writing about spray painting. Believe it or not, sewing and spray painting have a lot in common. Selecting a color, questions about preparing the items, and concerns about actually doing the work had been keeping me from starting a spray painting project. These are the same types of thoughts that can keep you from sewing something. Choosing fabric(s), measuring, pinning, and cutting material, and actually using the sewing machine can be barriers to getting started on a sewing project. My husband, Douglas, and I had an outdoor dining set sitting on our recently built deck. It consisted of a round metal table and chairs. The deck was just over a year old but Douglas and I purchased the metal table and chairs from a friend over 10 years ago. Our friend had them for almost 10 years herself, so the dining set was not new. 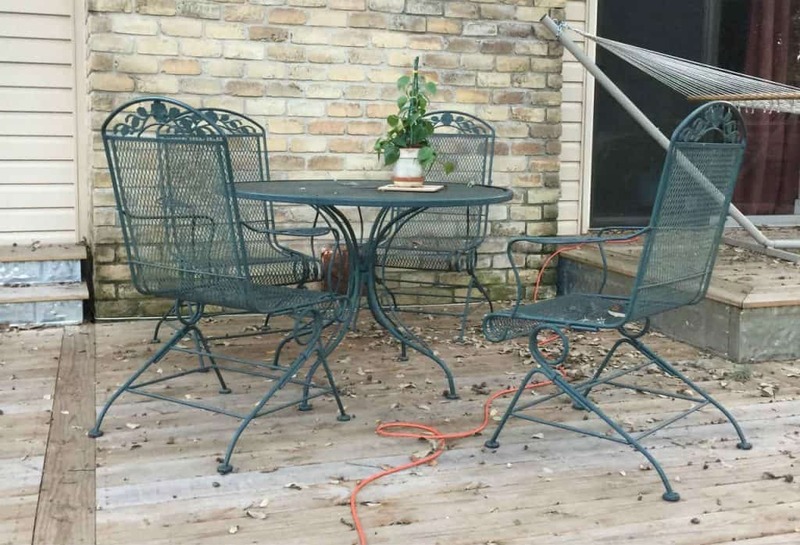 The table and chairs were the original green color which had faded from sitting in the elements for almost 20 years. In addition, there were several rust spots. For years, all I wanted to do was repaint the set a different color but I couldn’t seem to start this project. Selecting a color was one of the unknowns that kept me from getting started. 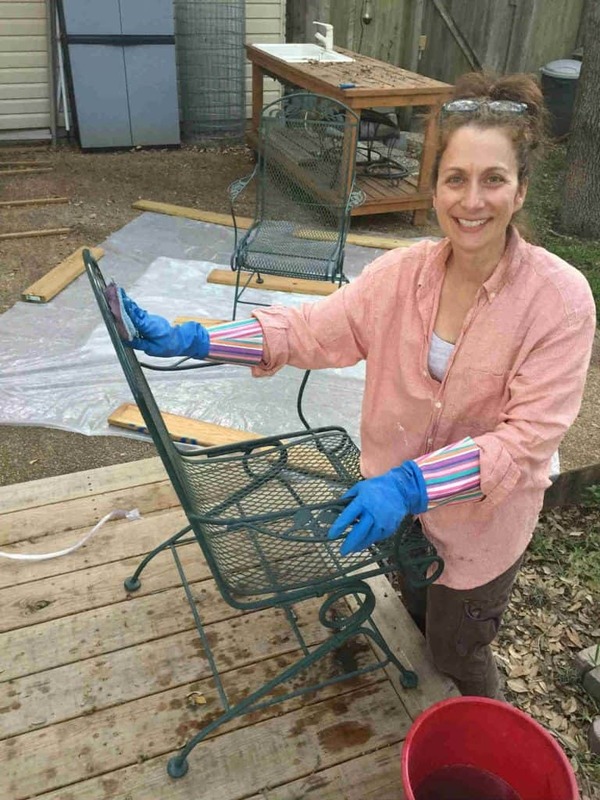 Even before we built the deck, I knew I wanted to paint the table and chairs. I just didn’t know what color. In the house my grandparents built in the 1950’s, they had a covered side porch for as long as I can remember. I loved the porch and was especially drawn to the gray glossy paint my grandpa used to paint the floorboards. The paint he used made it seem as if the boards had just been painted. I loved the fresh clean look. After building the deck, Douglas and I talked about painting the entire deck a glossy gray but eventually decided against it. 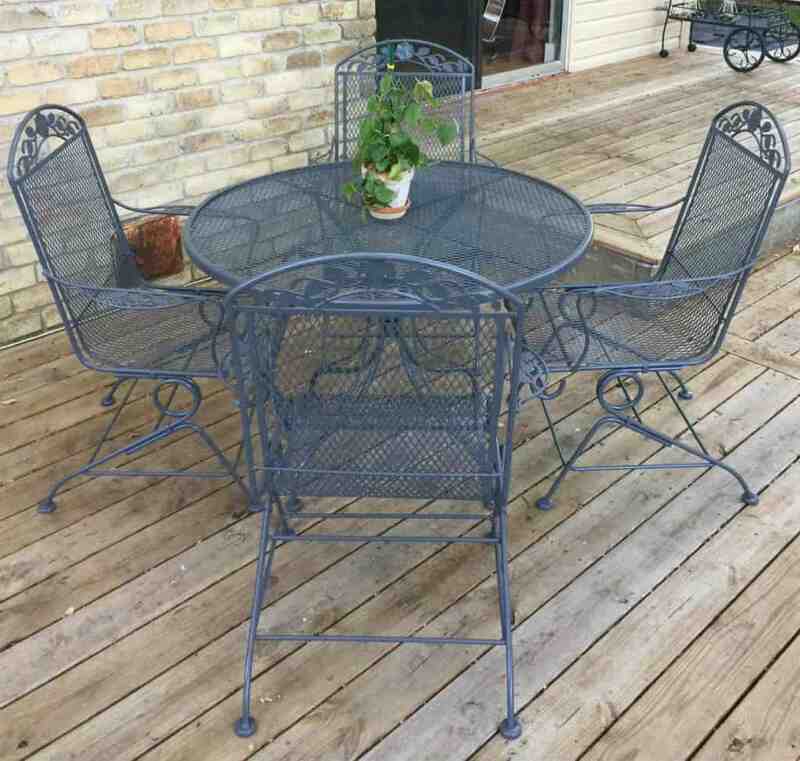 Instead, we realized gray would be a great color to paint the metal table and chairs. The gray color would be reminiscent of my grandparents’ porch and a glossy finish would provide that special sparkle of ongoing apparent newness. We selected Rust-Oleum Painter’s Touch 2X Ultra Cover Paint + Primer. The Dark Gray color was a match for how I remembered the color of my grandparents’ porch and it was in a gloss finish. The necessity of priming the metal before painting was one of the questions I had about the process of spray painting. Therefore, the combination of paint and primer appealed to me and made that one less step I needed to worry about. 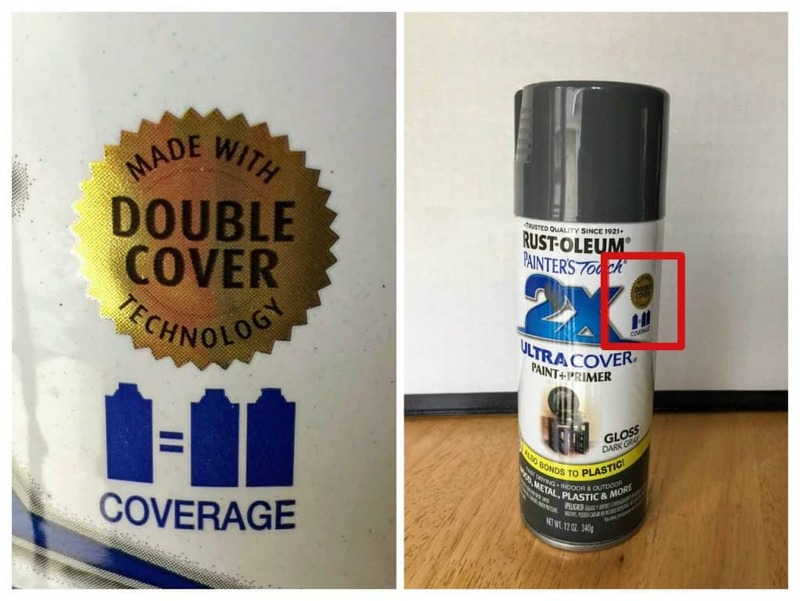 Also, the 2X Ultra Cover meant one can of this spray paint would cover as much as two cans of regular spray paint. This would save us a little bit of money. Reading the directions on the can of spray paint, watching multiple demonstrations from online videos, and talking with the paint expert at Home Depot, made prepping seem less intimidating. Did areas where I could see and feel paint that did not come off with the wire brush need to be sanded until they were smooth? What grit of sandpaper should be used to remove the shine on glossy areas? Could I scratch the metal if the sandpaper grit was too rough? Is there a certain soap I need to use? The answers to these questions varied from source to source. I made the decision to not buy any additional tools, use sandpaper and soap I had at home, and deal with situations if they arose. After I got started, everything went pretty smoothly. The wire brush wasn’t the most effective in removing the rust. However, it did a good job on the small amount of loose paint that was on the table and chairs. Because I was concerned with scratching the metal, I started with the finest grit sandpaper I had at home (120-grit) to remove the remaining rust. It worked alright but required a lot of rubbing. So, I tried the next grit up that I had which was an 80-grit. It worked better and, in addition to removing the rust, it actually smoothed the area between where the rust had been and the paint that remained. Once the rust and loose paint had been removed, I added a little dish soap to water in a bucket, washed everything, rinsed it well with the hose, and left it outside to dry. After I did research on these particular scenarios and learned more about spray painting, my run-away thoughts became more manageable. I stopped overthinking everything and was only slightly nervous when I actually got ready to paint. Douglas even found a special handle in the garage that attached to the top of the can so I didn’t have to worry about a cramping finger! After taking a deep breath and holding it, I pulled on the trigger and sprayed a few sweeps of paint across the first chair. 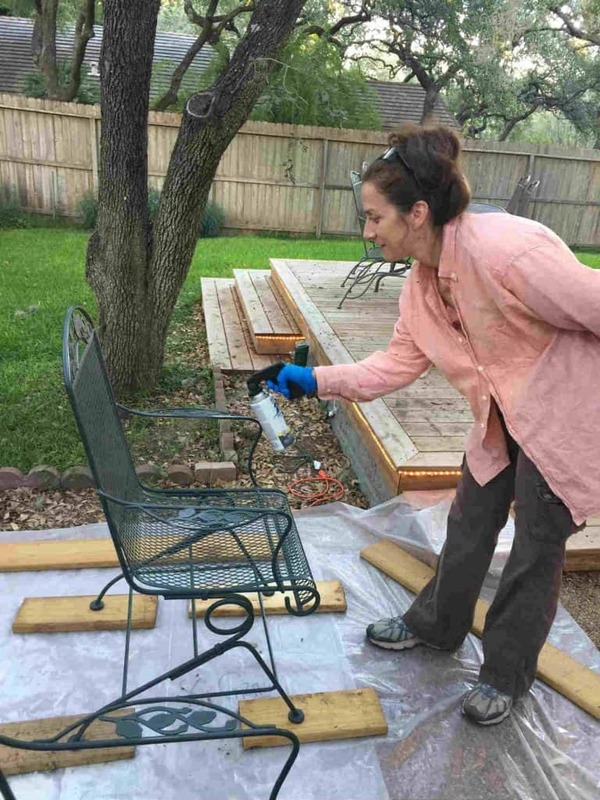 It was exhilarating…spray painting was fun! The visual impact of the freshly painted chair was inspirational! I finished painting the remaining chairs and table. 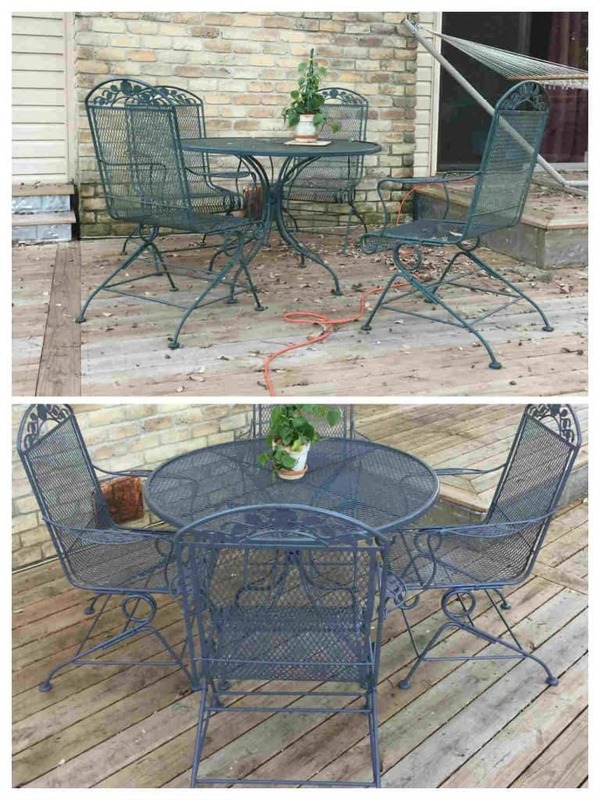 In 24 hours I had a beautiful, glossy gray outdoor dining set! Why had I waited so long to do this? Armed with the knowledge I learned through my research, all the questions and feelings I had experienced prior to starting the project became a distant memory. All the mental angst I had put myself through was just a minuscule blip in my thoughts. The only thing I could focus on was the amazing feeling of success and the before and after pictures of what I had accomplished! Note: The catalyst for researching and doing this project was my 2017-2018 School Year Challenge. If I hadn’t made the metal table and chairs a goal for October, they would probably still be faded green. 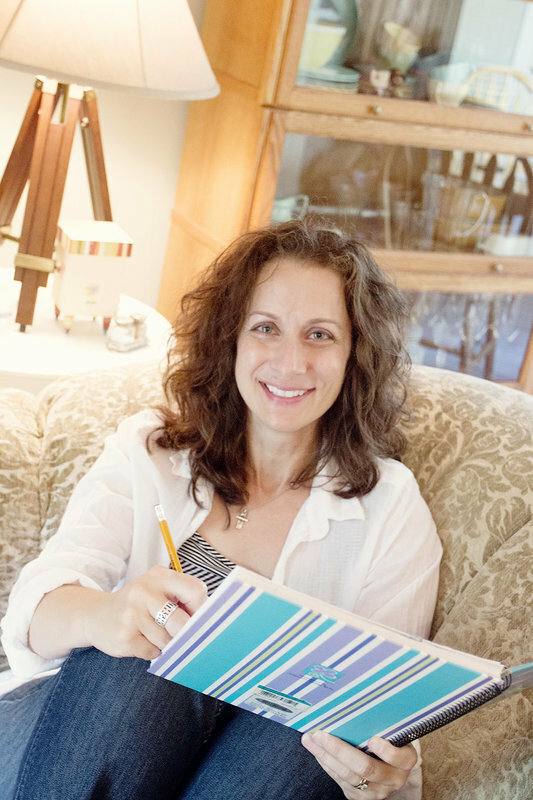 You can read about all of my October projects here: Success in October! Set a deadline for completing the project. Tell someone about your project and deadline to hold you accountable. Identify specifically what is keeping you from getting started. Prioritize and address each barrier one at a time. Use online and print resources. Talk with people who have done the type of project that is intimidating you. Ask questions when you start shopping for materials. Pay attention to what details are common among the sources and use that knowledge to begin your project. Start the project with the information you have. Don’t let your imagination of possible scenarios keep you from getting started. Address issues as they come up. Use people, print, and online resources to find answers. Don’t give up if things don’t go as planned. Step back and take a break. Regroup. Think about what you know and have learned. Do additional research if necessary. Ask for help if you need it. Stay focused on how far you have come and push forward to success! Believe in yourself. You can complete this project!